Today is the annual Day of Service and Giving on what would have been the 23rd birthday of an Eagle Grove boy. 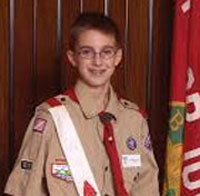 Aaron Eilerts was 14 when he was killed by a tornado that hit the Boy Scout camp in Harrison County in 2008. Beth Stephas, a counselor at Robert Blue Middle School, says students at Aaron’s old school are tackling 14 projects, several which were started by Aaron. “We have a large group that will be sewing pillow cases that will be donated to the local hospitals for patients,” Stephas says. “We have students that will be doing pet blankets, a project Aaron did that benefited the Humane Society, making blankets for the pets in the kennels.” Students have branched off and launched their own community service projects which Stephas says are inspired by Aaron’s memory. “One of those is a project we’ve been doing every year where we take plain, white pillow cases and decorate those to send to service people that have been deployed,” she says. Other kids are making dolls that will be sent to Haiti, while others are crafting little lending libraries to place around town. Stephas says it’s a real honor for the students to be carrying on Aaron’s thoughtful volunteer efforts year after year. “Many of them were just toddlers at the time Aaron died, so for them to be able to learn a little bit about his heart and then be able to participate in projects that he did, what a wonderful learning opportunity for our kids and a fantastic legacy to the memory of Aaron Eilerts.” Former Iowa Governor Chet Culver signed a proclamation in 2008 marking February 24th as a statewide Day of Service and Giving in memory of Eilerts. The Robert D. and Billie Ray Center gives out an award each summer to an Iowan who follows the lead of Aaron Eilerts in giving back to their communities during the Iowa Character Counts Awards ceremony.